The ancient Greek city of Hierapolis in Phyrgia (modern-day Pamukkale, Turkey) was built on top of the white castle which is in total about 2,700 metres long, 600 m wide and 160 m high. It can be seen from the hills on the opposite side of the valley in the town of Denizli, 20 km away. The hot springs have been used as a spa since the 2nd century BC, with many patrons retiring or dying there. The large necropolis is filled with sarcophagi, most famously that of Marcus Aurelius Ammianos, which bears the earliest known example of a crank and rod mechanism. The great baths were constructed with huge stone blocks without the use of cement and consisted of various closed or open sections linked together. There are deep niches in the inner section, including the bath, library, and gymnasium. 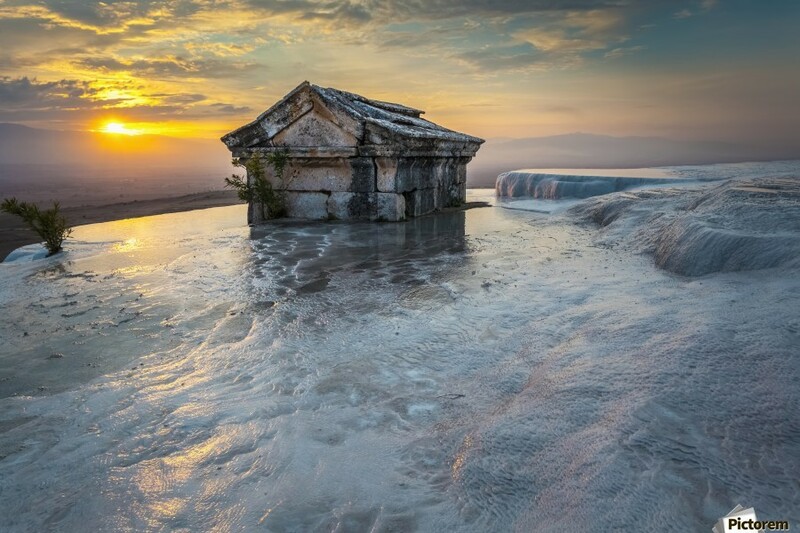 Tomb Submerged In A Travertine Pool In Hierapolis At Sunset; Pamukkale, Turkey. There are only few historical facts known about the exact origin of the city and no reliable sauces proving the existence of permanent settlement here in the pre-Hellenic period. The northern necropolis of Hierapolis in Phrygia with many different types of tombs. However, there are some sources indicating that after the fall of Troy, many colonists migrated to Anatolia from Greece and south east Europe in the Hittite Period. But it is still unknown if they established new cities or captured the existing cities or lived side by side with others. Herodotus in his Histories refers to a Phrygian border town in the area called Kydrara. The Greek town named Hierapolis was founded sometime in the 3rd century BC by the Seleucids. The area was the centre of a local Cybele cult but in the Greek polis the cult of Apollo Lairbenos was dominant (with Plutonium, the entry to the underworld, at its centre).